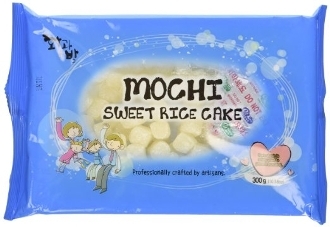 Original flavored mini mochi is delicious gluten free Asian dessert guaranteed to satisfy your sweet cravings. With a soft and chewy texture, our Mini coconut Flavored Mochi (aka Rice Cake) is one of our most popular treats. Eat them by themselves or enjoy them as a topping with your frozen yogurt! *Mini Mochi does not require refrigeration and have a shelf-life up to 10 months (from manufacturing date). Recommended to use within 24hrs. once opened and it can last 3-5 days after being opened, if re-sealed air tight and stored in a dry/cool space.